The tales of Captain Horatio Pugwash and his far from terrifying crew of pirates prompt memories of a gentler era. 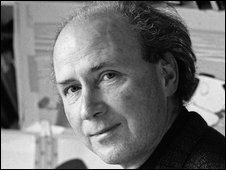 John Ryan, the man behind the comic creation, has died aged 88, provoking an outpouring of nostalgia and warm tributes to his artistry and great stories. 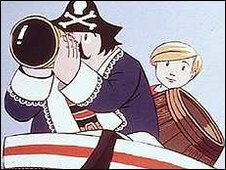 TV, of course, propelled the pirate to a mass audience - a privileged generation that was also being fed a diet of Bagpuss, Trumpton and Mr Benn. Children's laureate and author Anthony Browne was one of many to remember Pugwash vividly from his youth. He said that a combination of respect for the audience, the fact viewing figures didn't matter, plus real passion and belief made this a golden era. That simple but hard to achieve equation allowed Ryan's personality to come through. "There was nothing slick - his gentle nature permeated the stories," he told the BBC News website. But Pugwash would sail into stormy waters - false claims that Ryan's stories were peppered with double entendre dogged his creation. Browne condemned the "smutty innuendo" that plagued the captain, saw the stories fall out of favour and, eventually, drove the books out of print. Far from it, the humour that permeated the Pugwash books was a mischievous innocence - more schoolboy pun than Carry On. Ryan himself was a warm character described by his agent, Jane Gregory, as an "absolute gentleman". He was distressed at what had happened to his creation but grateful towards the end of his life to see his stories re-emerge to new audiences, following a new cartoon series and publishing deal. He said: "I'm a lucky man, because I've managed to earn a living by doing what I love: drawing and painting every day! And I've been supported by my wonderful wife, children and grandchildren, who've helped keep Pugwash afloat, sailing the high seas for 57 years!" Ryan is said to have developed a life-long fascination with pirates after his family moved to Morocco when he was a child. During World War II he fought in Asia, often finding himself in trouble for his caricatures of senior officers. He married in 1950 and, as a cash-strapped Harrow school teacher, he was on the lookout for a means to supplement his salary. John Cary, who worked on the 1998 animations for ITV, told Five Live that Ryan's success was the result of a challenge. Ryan had met Eagle magazine publisher the Reverend Marcus Morris who said he would publish his work if he came up with something "funny". The creation of Captain Pugwash swiftly followed. Since 2007 some of the books have been back in print again, published this time by Frances Lincoln Children's Books. Janetta Otter-Barry, who commissioned them, recalled Ryan's pleasure at a book launch in Rye, the historic East Sussex town where the author lived. "He signed every book with a private picture. I found him to be genial and unpretentious." So why do the books have lasting appeal? "I think the naughty pirate is timeless - and John created a crew of wonderful characters. They are almost like children. And it's witty too, the most grown-up of them is the cabin boy," said Ms Otter-Barry. "Most of all he could write a rollicking good story." It wasn't long before tributes cropped up on Facebook and other social networking sites as fans shared their thoughts on John Ryan's passing. "Oh no!! What sad news!! Captain Pugwash was such a part of my childhood. I loved the theme tune and even hearing it now makes me happy and nostalgic. Thank you John Ryan for making so many people happy," wrote Gill Parker on the lasting tribute website, airing sentiments that will be felt by many.